Almost forty years of professional flying in more than a dozen aircraft types—from supersonic RCAF jet fighters to helicopters to B747s—along with summer flying training while attending The Royal Military College of Canada, a solid career on the flight decks of a fleet of Air Canada aircraft, RCAF/Government VIP Challenger flights transporting heads of state and royal houses, and a career finishing in the left seat of the Boeing 767 comprise the high-flying highlights of retired Captain A. Kent Smerdon’s career as a pilot. And it makes for a fascinating read. Here, find a highly personal collection of airborne war stories that capture the experience of a career spent on many different kinds of wings. 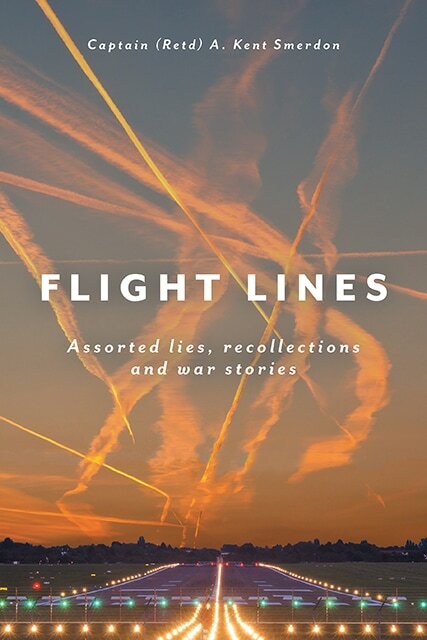 Flight Lines: Assorted Lies, Recollections, and War Stories is fast-paced and delightfully studded with personal touches, high drama, and thundering humour. Readers are treated to the inside experiences of a flying man, complete with intimate insights, technical asides and a steady current of entertaining stories about the enduringly compelling adventures of a full-throttle life airborne. "Captain Smerdon introduces us to his sometimes wacky world of flying and captures many of our own remembrances of some crazy things we did decades ago. This delightful quick read is a humourous, thoughtful and provocative retrospective of a career in both military and civilian flying worlds. A MUST read."